a little girl at the fall festival that I was shooting. She was too cute. The comments that indicate that it doesnt meet the challenge confuse me, they must be looking at something else. I think its a good image.! she's searching for the ice she just dropped. it was crystal clear to me. I gave this a 7, which was as much as I gave anything in this lackluster challenge. Looks like she found it. Not sure how well it fits with the theme, but I like the image. The light play and the angle are great for me. Additionally the color contrast the snowcone brings in make the shot even better. Nice job. It's a cute pic, but I don' see a connection to searching. 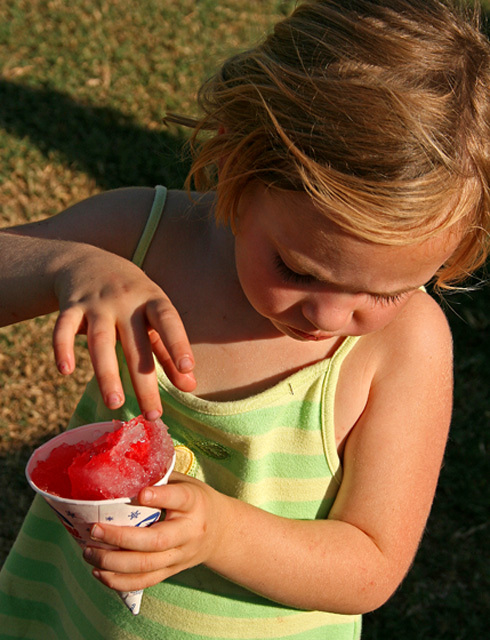 Did she drop the top of the snowcone? If so, a less closeup shot would've established the context. good shot but I don't believe it meets the challenge criteria of "Searching"
i'm confused with this...what is she searching for? Nice lighting. I like the anonymity of the main character since you can't see her eyes. I'm not sure how this photograph fits into the "Searching" category. What does this have to do with searching? What's this to do with the challenge? I fail to see the connection to the challenge topic. Proudly hosted by Sargasso Networks. Current Server Time: 04/22/2019 12:33:44 AM EDT.